Following a week of accolades abroad, President Enrique Pena Nieto returned home to face the worst political crisis of his administration. Protests rage after local police forcibly disappeared 43 students of Ayotzinapa, a rural teaching college in the southern Mexico state of Guerrero. As the investigations continue, the crisis has laid bare the violence and corruption that control large parts of the nation. Led by youth, protestors across the country blame the government for the attack and others like it. As the father of one of the missing students said, "The government knows where they are." His tone expressed deep fatigue and even deeper pain. On the night of September 26, police patrol cars from the city of Iguala blocked the buses his son and other students were traveling in, and opened fire on the students. In a bizarre series of events, an armed commando attacked the students in the same spot hours later. During the night, more students from Ayotzinapa arrived to rescue their companions, and members of the state teachers' union came to help. The shooting went on. Nearby, a third attack -- on a local soccer team possibly mistaken for Ayotzinapa students -- left another youth dead. Videotapes in the hands of the Guerrero state prosecutor's office reportedly show that local police also participated in this attack, which appears to be a case of mistaken identity. Federal police arrived at the scene at least two hours later and refused to attend to the wounded. By all accounts, law enforcement agents limited their activities to firing on the students and carrying off the 43 who are now disappeared. No law enforcement officials – at local, state, or federal levels -- protected the young people under attack, despite massive deployment to fight the war on drugs. Survivors report that they carried the wounded to a nearby army base, where army personnel refused to aid them. Not one soldier stepped forward to try to stop the massacre of the youth. The Tlachinollan Human Rights Center of Guerrero issued an urgent alert on September 29 stating, "These events demonstrate an excessive use of force and an intention to deliberately extrajudicially execute students by the Municipal Police and an omission on the part of state and federal authorities for failing to implement appropriate security measures that would have prevented a second aggression and the disappearance of 55 local students." (43 remain missing, as 12 were subsequently located alive). It may be impossible to fit together logically all the pieces of who ordered the attack and why. It's also possible that the attackers may not have acted logically. To make matters more complex, within that debate there is a consensus that the line between organized crime and government in the city was long ago erased by collusion between the two. The attorney general recently announced that investigations showed the mayor of Iguala ordered the attack on the students. He is accused of having close ties to the regional organized crime cartel Guerreros Unidos, allegedly run by his wife's brothers until two of them were assassinated and the third went into hiding. The government is also blamed because it has entirely failed to keep the peace in Guerrero, a state that combines the worst aspects of government abuse and criminal violence. The area outside Iguala is one of the most important drug production regions of the country. The state's political corruption guarantees protection and impunity. Its history of opposition, including by armed groups, makes it a nodal center for repression as well. But the students are convinced that the criminal group is not behind the killings. A student who prefers to remain anonymous due to the climate of persecution that exists, stated, "This was the government because they're the only pigs that would dare to kill innocents like that. Criminals kill each other. Not the government: the government attacks the people directly." In Iguala, reality reared its ugly head just as the international press was tripping over itself to praise the well-groomed president. The Pena administration has spent millions of dollars to improve its image, hiring the U.S. lobbying firms Chlopak, Leonard, Schechter & Associates and APCO public relations, among others. Part of that effort has been a calculated move to downplay the violence as well as the war on drugs of Pena's predecessor's, which had become a political liability. The U.S. government has encouraged a new public emphasis on economic reforms and cultural ties, while still directing the majority of its aid to the war on drugs. But despite his overdue declarations to investigate and punish the perpetrators of the Ayotzinapa attack, Pena Nieto has a dilemma on his hands. A full investigation and prosecution would undoubtedly touch members of his own cabinet -- particularly Attorney General Jesus Murillo Karam and Secretary of the Interior Miguel Angel Osorio Chong. The attorney general's office allowed Iguala mayor José Luis Abarcato to escape and now admits there were errors in digging up 28 bodies from a clandestine grave that informants said were the students. 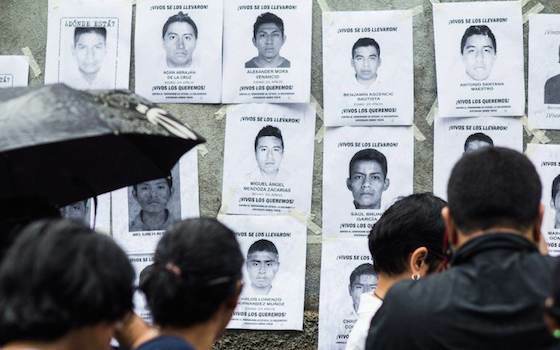 Murillo Karam reported that DNA testing showed the bodies are not the missing students, although tests continue. The federal government also did not respond to many warning signs regarding corruption and illegal acts in Iguala and the region. In a too-little, too-late measure, federal police were sent out to take control of 13 municipalities suspected of ties to organized crime. Security forces under the secretary of the interior failed -- by all appearances purposefully -- to protect the students. On October 22, Mexican youth and people throughout the world joined in demanding that the students be brought back alive. Nothing is as important as this demand. It's essential for the families, for the reputation of the nation, and for restoring a modicum of faith in the government. If the students have been murdered, their families have a right to know as soon as possible. After that, huge challenges will remain. The Mexican government must begin to enforce the law, even against those with money and power. And the U.S. government must finally face up to its responsibility to suspend the Merida Initiative's security aid to Mexican forces that murder their own youth. "The Mass Shooting in Mexico"